Feathers are not usually my cup of tea. I don’t really know why other than I’m just not too fond of them but I kind of love the way Bobbette and Belle incorporated them into the design of today’s cake! People tend to fear having a simple all white cake because it may not be memorable or it may look boring to the guest (I vehemently disagree! 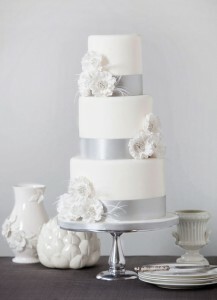 )…but with a touch of floral and other accessories you can kick up your wedding cake to the level of unforgettable! Bobbette and Belle, based out of Toronto, have set this cake apart by doing just that. 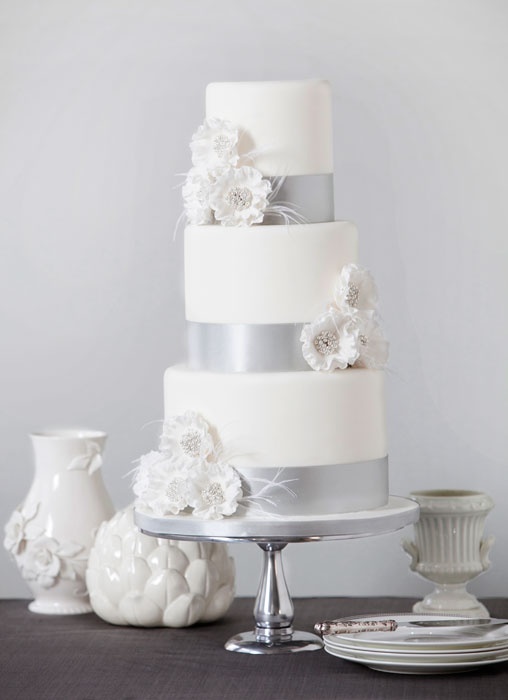 They designed the cake with extra high tiers and accented the elegant white cake with silver along the base of each tier. Then they crafted ruffled sugar flowers, accented with silver sugar pearls, and topped it off with a few ostrich feathers. And voila!